Procrastination -- A Fancy Word For Laziness? - Something New Everyday! Home improvement Procrastination -- A Fancy Word For Laziness? Procrastination -- A Fancy Word For Laziness? Have you ever found yourself in a situation where you sat down to do an important task only to then realize that your clothes needed ironing? Or that your computer data collection was in need of some serious reorganizing? And then there's this fascinating documentary on bird migration on YouTube that you just can't put off watching any longer. And since you'll be watching a video might as well go ahead and make something to eat to go with it, right? Fast forward a few hours and it's already late. With your important task remaining as unfinished as the sky is blue. Sound familiar? Then congratulations, you like millions of other people, have experienced procrastination. But what exactly is procrastination? Many people view it as nothing more than a fancy word for laziness, or lack of self-discipline. Yet, for procrastinators, it is a powerful and often uncontrollable force. Something that wastes valuable time, causes missed deadlines, poor academic and work performance. Worst of all, it contributes to emotional stress, anxiety and guilt. In most serious cases it can greatly hamper a procrastinator's quality of life. A sad truth backed up by a 1997 study conducted by Dianne Tice and Roy Baumeister of Case Western Reserve University. So what causes us to procrastinate? Let's take a look at what science has to say on the subject. Psychologists often view procrastination as an extreme form of coping mechanism. It kicks in when we experience anxiety or dread in relation to a future task. And so to avoid these negative feelings we direct our attention to something else. Many experts see procrastination as a result of a conflict sparked between two parts of the human brain when faced with a difficult task. The limbic system, the unconscious part of our brain that contains the pleasure center. And the prefrontal cortex, our "thinker" and decision-maker. When the former prevails, which is often the case, it results in us putting off today's task for tomorrow. Needless to say, tomorrow never comes. Timothy Pychyl, a psychology professor at Carleton University, in Ottawa, puts it into simpler terms. The prefrontal cortex, unlike the limbic system, does not function automatically. It has to be actively focused on the task. The moment you're not engaged enough the limbic system takes over. Which, in turn, makes you focus on whatever brings immediate pleasure. Another interesting theory suggests that the reason procrastination is so difficult to deal with might be tied to our perception of time and the difference between how we see our present and future selves. So even though we know that a year from now we will be the same person we are today, most of us lack any sort of empathy or emotional connection to that future version of ourselves. And so we "delegate" important tasks to our future selves without realizing that present us and future us is the same person. And that person will have to suffer the consequences. Several scientific studies support this theory. Such as the one conducted by Hal Hershfield, a psychologist at UCLA Anderson School of Management. He took fMRI scans of people's brains as they were asked to think about themselves in the present, a famous person, and then themselves in the future. He discovered that people use different parts of their brain when processing information about their present and future selves. 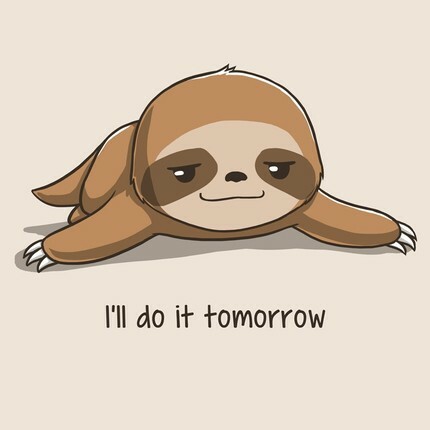 Now that we have a better idea about the nature of procrastination, what can we do to control it or at the very least learn to reduce the negative impact it can have on our lives? Well, it is generally suggested that maintaining a positive outlook and being kinder to ourselves can have a visible positive effect. And curiously enough, one of the best things we can do is to forgive ourselves for procrastinating. Yes, as naïve as it may sound, it is surprisingly effective - as evidenced by one of Dr. Pychyl's studies where students who reported forgiving themselves for procrastinating on studying for one exam ended up procrastinating less for the next. The reason this works is because procrastination is tied to several negative feelings, such as anxiety and guilt, which forgiving oneself can help alleviate. But by far the most useful advice Pychyl gives us is to stop waiting until we're in the right mood to perform a certain task. We need to realize that our belief that our emotional state has to match our current task is extremely counterproductive. Ignore how you feel about doing something and just do it. Break down your task into several smaller ones that are easier to accomplish. Even small and incremental progress can make you feel better about the task and yourself, reducing your desire to procrastinate. Our willpower is not unlimited, so by tackling the biggest task while the energy is still there, you increase your chances of success overall. Solicit support from friends or family. Tell a friend or a family member about a task you're trying to get done. When you're committed and accountable to someone else besides yourself, you are a lot more motivated to actually follow through with it. Sign up for language courses or a gym membership with a non-refundable deposit, creating an obligation that would be difficult for you to back out of. Keep track of the time you spend on things throughout the day. Set up a timesheet with a list of your daily, weekly and monthly tasks. Put down the amount of time that you spend on those tasks, as well as the time that you actively spend on everything else to avoid them. You might find the results quite eye-opening, if not shocking! Use that information to fuel your motivation and the desire to work on your productivity.